It is with a heavy heart that I bring the news that our beloved friend and brother, Butch Blackmon, has gone home to be with the Lord. Butch arranged our escorts and was always there, leading our way. He was a long time member of Blue Knights TX VII and a huge part of the Texas Honor Ride. 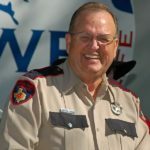 He served as a Harris County Pct. 4 Constable. Butch, fly high brother. You will be missed.